American test pilot mission specialist astronaut 1996-2011. Status: Inactive; Active 1996-2011. Born: 1957-03-31. Spaceflights: 3 . Total time in space: 39.60 days. Birth Place: El Paso, Texas. PERSONAL DATA:�Born March 31, 1957 in El Paso, Texas. Married to the former Diana Lynn Morris of Springfield, Virginia. They have two children. He enjoys baseball and running. Pat's mother, Patsy L. Forrester, resides in Houston, TX. His father, Colonel (ret.) Redmond V. Forrester is deceased. Diana's father, Colonel (ret.) Lurie J. Morris, resides in Hendersonville, North Carolina. Her mother, Bettye Morris, is deceased. EDUCATION:�Graduated from West Springfield High School, Springfield, Virginia, in 1975; received a Bachelor of Science Degree in Applied Sciences and Engineering from the United States Military Academy, West Point, New York, in 1979, and a Master of Science Degree in Mechanical and Aerospace Engineering from the University of Virginia in 1989. AWARDS:�Defense Superior Service Medal; Legion of Merit; Meritorious Service Medal (2nd Oak Leaf Cluster); Army Commendation Medal; Army Achievement Medal; National Defense Service Medal; Senior Air Force Space Badge; Expert Infantryman Badge. SPECIAL HONORS:�U.S. Army Aviation Hall of Fame (2011), Jack Northrop Award, Society of Experimental Test Pilots (1996); NASA Exceptional Service Medal (2008, 2010); NASA Space Flight Medal (2001, 2007, 2009); Order of St. Michael (Bronze 2001, Silver 2007); Lyndon B. Johnson Space Center Certificate of Commendation (1995). EXPERIENCE:�Forrester graduated from West Point in June 1979 and was commissioned as a Second Lieutenant in the U.S. Army. He entered the U.S. Army Aviation School in 1979 and was designated an Army Aviator in September 1980. He was subsequently assigned as an Instructor Pilot at the Aviation School and as the Aide-de-Camp to the Deputy Commanding General of the U.S. Army Aviation Center. In 1984, he was assigned to the 25th Infantry Division (Light), Schofield Barracks, Hawaii, where he served as a Platoon Leader, Aviation Company Operations Officer, and an Assault Helicopter Battalion Operations Officer. After completing a Master of Science Degree at the University of Virginia in 1989, he was assigned as a Flight Test Engineer and as the Research and Development Coordinator with the Army Aviation Engineering Flight Activity at Edwards Air Force Base, California. In June 1992, he graduated from the U.S. Naval Test Pilot School and was designated an Experimental Test Pilot. In 1992, he was assigned as an Engineering Test Pilot at the U.S. Army Aviation Technical Test Center, Fort Rucker, Alabama. Other military schools include the Army Parachutist Course, U.S. Army Ranger School, the Combined Arms Services Staff School, and the Command and General Staff College. A Master Army Aviator, he has logged more than 5,000 hours in over 50 different aircraft. Forrester retired from the Army in October 2005. NASA EXPERIENCE:�Forrester was assigned to NASA at the Johnson Space Center as an Aerospace Engineer in July 1993. His technical assignments within the Astronaut Office Operations Development Branch have included: flight software testing with the Shuttle Avionics Integration Laboratory (SAIL); Astronaut Office Representative for Landing/Rollout issues, Multi function Electronic Display System (MEDS) upgrade of the orbiter fleet and the Portable In-flight Landing Operations Trainer (PILOT). He has also served as the crew representative for robotics development for the International Space Station. Forrester was selected as a Mission Specialist Astronaut Candidate by NASA in May 1996. He completed two years of training and evaluation and was qualified for flight assignment as a Mission Specialist. Initially, Forrester was assigned to duties at the Kennedy Space Center as a member of the Astronaut Support Team, responsible for shuttle prelaunch vehicle checkout, crew ingress and strap-in and crew egress after landing. He next served as the Technical Assistant to the Director, Flight Crew Operations. Following that, Forrester served as the Shuttle Training and Onboard Crew Procedures Representative. He has also served as a Capsule Communicator (CAPCOM) for both International Space Station and shuttle missions. Forrester flew on STS-105 (2001), STS-117 (2007) and STS 128 (2009). He has logged more than 950 hours in space, including four spacewalks, totaling 25 hours and 22 minutes of EVA time. SPACEFLIGHT EXPERIENCE:�STS-105 Discovery (August 10 to August 22, 2001) was the 11th mission to the International Space Station. While at the orbital outpost, the STS-105 crew delivered the Expedition 3 crew, attached the Leonardo Multi-Purpose Logistics Module (MPLM) and transferred more than 2.7 metric tons of supplies and equipment to the station. During the mission, Pat Forrester and Dan Barry performed two spacewalks totaling 11 hours and 45 minutes of EVA time. Forrester served as the prime robotics operator to install the MPLM. STS-105 also brought home the Expedition 2 crew. The STS-105 mission was accomplished in 186 orbits of the Earth, traveling more than 4.9 million miles in 285 hours and 13 minutes. STS-117 Atlantis (June 8 to June 22, 2007) was the 118th shuttle mission and the 21st mission to visit the International Space Station, delivering the second starboard truss segment, the third set of U.S. solar arrays and batteries and associated equipment. The successful construction and repair mission involved four spacewalks by two teams. Forrester accumulated 13 hours and 37 minutes of EVA time in two spacewalks. The mission also delivered and returned with an expedition crewmember. STS-117 returned to land at Edwards Air Force Base, California, having traveled 5.8 million miles in 14 days. STS-128 Discovery (August 28 to September 11, 2009) was the 128th shuttle mission and the 30th mission to the International Space Station. While at the orbital outpost, the STS-128 crew rotated an expedition crewmember, attached the Leonardo MPLM and transferred more than 18,000 pounds of supplies and equipment to the space station. The STS-128 crew conducted three spacewalks. Forrester served as the prime robotics operator for Discovery. The STS-128 mission was accomplished in 217 orbits of the Earth, traveling more than 5.7 million miles in 332 hours and 53 minutes and returned to land at Edwards Air Force Base, California. Born March 31, 1957 in El Paso, Texas. Married to the former Diana Lynn Morris of Springfield, Virginia. They have two children. He enjoys baseball, running, and coaching youth sports. His parents, Colonel (ret.) Redmond V. and Patsy L. Forrester, reside in Fort Walton Beach, Florida. Her father, Colonel (ret.) Lurie J. Morris, resides in Prattville, Alabama. Her mother, Bettye Morris, is deceased. Graduated from West Springfield High School, Springfield, Virginia in 1975; received a bachelor of science degree in applied sciences and engineering from the United States Military Academy, West Point, New York, in 1979, and a master of science degree in mechanical and aerospace engineering from the University of Virginia in 1989. Society of Experimental Test Pilots; Army Aviation Association of America; American Helicopter Society; United States Military Academy Association of Graduates; West Point Society of Greater Houston. Meritorious Service Medal (2nd Oak Leaf Cluster); Army Commendation Medal; Army Achievement Medal; National Defense Service Medal; Expert Infantryman Badge. The Jack Northrop Award for most outstanding presentation at the 26th Annual Society of Experimental Test Pilots Symposium (1996). The Lyndon B. Johnson Space Center Certificate of Commendation (1995). Forrester graduated from West Point in June 1979 and was commissioned as a Second Lieutenant in the U.S. Army. He entered the U.S. Army Aviation School in 1979 and was designated an Army aviator in September 1980. He was subsequently assigned as an instructor pilot at the Aviation School and as the Aide-de-Camp to the Deputy Commanding General of the U.S. Army Aviation Center. In 1984, he was assigned to the 25th Infantry Division (Light), Schofield Barracks, Hawaii, where he served as a platoon leader, aviation company operations officer, and an assault helicopter battalion operations officer. After completing a master of science degree at the University of Virginia in 1989, he was assigned as a flight test engineer and as the research and development coordinator with the Army Aviation Engineering Flight Activity at Edwards Air Force Base, California. In June 1992, he graduated from the U.S. Naval Test Pilot School and was designated an experimental test pilot. In 1992, he was assigned as an engineering test pilot at the U.S. Army Aviation Technical Test Center, Fort Rucker, Alabama. Other military schools include the Army Parachutist Course, U.S. Army Ranger School, the Combined Arms Services Staff School, and the Command and General Staff College. Master Army Aviator, he has logged over 3000 hours in 49 different aircraft. Forrester was assigned to NASA at the Johnson Space Center as an aerospace engineer in July 1993. His technical assignments within the Astronaut Office Operations Development Branch have included: flight software testing with the Shuttle Avionics Integration Laboratory (SAIL); astronaut office representative for Landing/Rollout issues, Multi-function Electronic Display System (MEDS) upgrade of the Orbiter fleet, and the Portable In-flight Landing Operations Trainer (PILOT). He has also served as the crew representative for robotics development for the International Space Station. 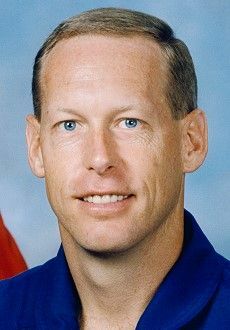 Forrester was selected as an astronaut candidate by NASA in May 1996 and is undergoing training and evaluation for qualification for assignment as a mission specialist. Family: Astronaut. Country: USA. Spacecraft: ISS. Flights: STS-105, STS-105 ISS EO-3, STS-117, STS-128. Agency: US Army. Bibliography: 12, 5397. 1957 March 31 - . Birth of Patrick Graham Forrester - . Nation: USA. Related Persons: Forrester. American test pilot mission specialist astronaut 1996-2011. 3 spaceflights, 39.6 days in space. Flew to orbit on STS-105 (2001), STS-117, STS-128..
1983 December 5 - . NASA Astronaut Training Group 16 selected. - . Nation: USA. Related Persons: Brown, David, Burbank, Cagle, Caldeiro, Camarda, Carey, Clark, Fincke, Forrester, Frick, Guidoni, Herrington, Higginbotham, Hobaugh, Kelly, James, Kelly, Mark, Kelly, Scott, Lockhart, Loria, Magnus, Massimino, Mastracchio, McCool, Morin, Nowak, Pettit, Phillips. Mission Specialists: Bachelor's degree in engineering, biological science, physical science or mathematics and minimum three years of related experience or an advanced degree. Vision minimum 20/150 uncorrected, correctable to 20/20. Maximum sitting blood pressure of 140/90. Height between 150 and 193 cm.. 10 pilots and 25 mission specialists selected from over 2,400 applicants. 9 additional international astronauts. 2001 May 30 - . ISS Status Report: ISS 01-16 - . Nation: USA. Related Persons: Barry, Forrester, Helms, Voss. Program: ISS. Flight: STS-102 ISS EO-2. 2001 August 1 - . ISS Status Report: ISS 01-23 - . Nation: USA. Related Persons: Barry, Culbertson, Dezhurov, Forrester, Helms, Horowitz, Sturckow, Tyurin, Voss. Program: ISS. Flight: STS-102 ISS EO-2. 2001 August 8 - . ISS Status Report: ISS 01-24 - . Nation: USA. Related Persons: Barry, Culbertson, Dezhurov, Forrester, Helms, Horowitz, Jett, Sturckow, Tyurin, Voss. Program: ISS. Flight: STS-102 ISS EO-2. 2001 August 10 - . 2001 August 10 - . 21:10 GMT - . Launch Site: Cape Canaveral. Launch Complex: Cape Canaveral LC39A. LV Family: Shuttle. Launch Vehicle: Space Shuttle. STS-105 - . Call Sign: Discovery. Crew: Barry, Culbertson, Dezhurov, Forrester, Horowitz, Sturckow, Tyurin. Payload: Discovery F30 / Leonardo. Mass: 116,914 kg (257,751 lb). Nation: USA. Related Persons: Barry, Culbertson, Dezhurov, Forrester, Horowitz, Sturckow, Tyurin. Agency: NASA Houston. Manufacturer: Boeing. Program: ISS. Class: Manned. Type: Manned spaceplane. Flight: STS-105, STS-105 ISS EO-3. Spacecraft Bus: Shuttle. Spacecraft: Discovery. Duration: 11.88 days. Decay Date: 2001-08-22 . USAF Sat Cat: 26888 . COSPAR: 2001-035A. Apogee: 402 km (249 mi). Perigee: 373 km (231 mi). Inclination: 51.60 deg. Period: 92.30 min. STS 105 was an American shuttle that carried a crew of ten (including three crew for the ISS - one American and two Russian), five tonnes of supplies, hardware, and a bedroom suite to accommodate a third astronaut in the Destiny module. The crew installed in the station two new science experiment racks that were carried in the Leonardo container which was first lifted out of the shuttle and bolted to the Unity module. Leonardo then carried back all the trash from the ISS back to the shuttle. They crew installed the MISSE (Materials International Space Station Experiment) container outside the ISS to test the effect of radiation on materials and some low-cost science experiments such as microgravity cell growth studies inside the station. STS-105 main engine cutoff was at 2118 GMT placed Discovery and external tank ET-110 into a 58 x 234 km x 51.6 deg orbit. At 2148 GMT Discovery reached apogee and fired its OMS engines to enter a 155 x 233 km x 51.6 deg orbit; another burn at 0100 GMT raised the orbit to 198 x 277 km. Discovery docked at the Station's PMA-2 port at 1842 GMT on August 12. After some problems aligning the docking system, the docking ring was retracted and latched at 1905 GMT and the hatch was opened to ISS at 2042 GMT. Expedition 3 began on August 13 at 1915 GMT when the new crew's seat liners were installed on the Soyuz transport ship. The formal EX-2/EX-3 change-of-command ceremony was held on August 17 in Destiny. The Leonardo MPLM module was lifted out of Discovery's payload bay at 1326 GMT on August 13 and docked to Unity's nadir at 1554 GMT. 3300 kg of cargo from Leonardo was transferred to the Station. Then 1700 kg of station garbage and materials were loaded into Leonardo. It was unberthed from Unity at 1816 GMT on August 19 and returned to the payload bay for the return to Earth at 1917 GMT. Discovery undocked at 1452 GMT on August 20 with the Expedition 2 crew aboard, leaving Expedition 3 at the Station. At 1830 GMT on August 20 the Simplesat test satellite was ejected from a GAS canister in the cargo bay. Discovery landed at Kennedy Space Center at 1822:58 GMT on August 22 on runway 15, after a deorbit burn at 1715 GMT. The Expedition Two crew of Usachyov, Voss and Helms had been in space for 167 days. Discovery was taken out of service after the flight for structural inspections. Its last maintenance down period was in 1995-1996. 2001 August 11 - . 2001 August 12 - . STS-105 Mission Status Report #04 - . Nation: USA. Related Persons: Barry, Culbertson, Dezhurov, Forrester, Helms, Horowitz, Sturckow, Tyurin, Voss. Program: ISS. Flight: STS-102 ISS EO-2, STS-105, STS-105 ISS EO-3. STS-105 Mission Status Report #05 - . Nation: USA. Related Persons: Barry, Culbertson, Dezhurov, Forrester, Helms, Horowitz, Sturckow, Tyurin, Voss. Program: ISS. Flight: STS-102 ISS EO-2, STS-105, STS-105 ISS EO-3. 2001 August 13 - . STS-105 Mission Status Report #06 - . Nation: USA. Related Persons: Culbertson, Dezhurov, Forrester, Helms, Ross, Tyurin, Voss. Program: ISS. Flight: STS-102 ISS EO-2, STS-105, STS-105 ISS EO-3. 2001 August 15 - . 2001 August 16 - . STS-105 Mission Status Report #13 - . Nation: USA. Related Persons: Barry, Culbertson, Dezhurov, Forrester, Horowitz, Sturckow, Tyurin. Program: ISS. Flight: STS-102 ISS EO-2, STS-105, STS-105 ISS EO-3. STS-105 Mission Status Report #12 - . Nation: USA. Related Persons: Barry, Culbertson, Dezhurov, Forrester, Horowitz, Sturckow, Tyurin. Program: ISS. Flight: STS-102 ISS EO-2, STS-105, STS-105 ISS EO-3. 2001 August 16 - . 13:56 GMT - . EVA STS-105-1 - . Crew: Barry, Forrester. EVA Duration: 0.26 days. Nation: USA. Related Persons: Barry, Forrester. Program: ISS. Class: Manned. Type: Manned spaceplane. Flight: STS-105. The spacewalk was made from the external airlock on Discovery. The astronauts transferred the Early Ammonia Servicer (EAS) device from the ICC carrier in the payload bay to the P6 truss on the station. Then they took two MISSE materials exposure experiment boxes from the ICC and attached them to the outside of the Quest airlock. 2001 August 17 - . STS-105 Mission Status Report #14 - . Nation: USA. Related Persons: Barry, Culbertson, Dezhurov, Forrester, Helms, Horowitz, Sturckow, Tyurin, Voss. Program: ISS. Flight: STS-102 ISS EO-2, STS-105, STS-105 ISS EO-3. STS-105 Mission Status Report #15 - . Nation: USA. Related Persons: Barry, Culbertson, Dezhurov, Forrester, Helms, Horowitz, Sturckow, Tyurin, Voss. Program: ISS. Flight: STS-102 ISS EO-2, STS-105, STS-105 ISS EO-3. 2001 August 18 - . STS-105 Mission Status Report #17 - . Nation: USA. Related Persons: Barry, Culbertson, Dezhurov, Forrester, Tyurin. Program: ISS. Flight: STS-102 ISS EO-2, STS-105, STS-105 ISS EO-3. STS-105 Mission Status Report #16 - . Nation: USA. Related Persons: Barry, Culbertson, Dezhurov, Forrester, Horowitz, Sturckow, Tyurin. Program: ISS. Flight: STS-102 ISS EO-2, STS-105, STS-105 ISS EO-3. 2001 August 18 - . 13:39 GMT - . EVA STS-105-2 - . Crew: Barry, Forrester. EVA Duration: 0.23 days. Nation: USA. Related Persons: Barry, Forrester. Program: ISS. Class: Manned. Type: Manned spaceplane. Flight: STS-105. The spacewalk installed Orbit-Installed Handrails and Launch-to-Activation Heater Cables on Destiny. The cables were needed for the installation of the S0 truss to be launched in early 2002. .
2001 August 19 - . STS-105 Mission Status Report #18 - . Nation: USA. Related Persons: Barry, Culbertson, Dezhurov, Forrester, Helms, Horowitz, Tyurin, Voss. Program: ISS. Flight: STS-102 ISS EO-2, STS-105, STS-105 ISS EO-3. STS-105 Mission Status Report #19 - . Nation: USA. Related Persons: Barry, Culbertson, Dezhurov, Forrester, Helms, Horowitz, Sturckow, Tyurin, Voss. Program: ISS. Flight: STS-102 ISS EO-2, STS-105, STS-105 ISS EO-3. 2001 August 20 - . STS-105 Mission Status Report #20 - . Nation: USA. Related Persons: Barry, Culbertson, Dezhurov, Forrester, Helms, Horowitz, Sturckow, Tyurin, Voss. Program: ISS. Flight: STS-102 ISS EO-2, STS-105, STS-105 ISS EO-3. 2001 August 21 - . STS-105 Mission Status Report #22 - . Nation: USA. Related Persons: Barry, Culbertson, Dezhurov, Forrester, Helms, Horowitz, Sturckow, Tyurin, Voss. Program: ISS. Flight: STS-102 ISS EO-2, STS-105, STS-105 ISS EO-3. 2001 August 22 - . Landing of STS-105 - . Return Crew: Barry, Forrester, Helms, Horowitz, Sturckow, Usachyov, Voss. Nation: USA. Related Persons: Barry, Forrester, Helms, Horowitz, Sturckow, Usachyov, Voss. Program: ISS. Flight: STS-102 ISS EO-2, STS-105. STS-105 landed at 18:23 GMT with the crew of Horowitz, Sturckow, Barry, Forrester, Usachyov, Voss and Helms aboard..
2001 August 23 - . ISS Status Report: ISS 01-25 - . Nation: USA. Related Persons: Barry, Culbertson, Dezhurov, Forrester, Helms, Horowitz, Sturckow, Tyurin, Voss. Program: ISS. Flight: STS-102 ISS EO-2, STS-105, STS-105 ISS EO-3. 2007 June 8 - . 2007 June 8 - . 23:38 GMT - . Launch Site: Cape Canaveral. Launch Complex: Cape Canaveral LC39A. LV Family: Shuttle. Launch Vehicle: Space Shuttle. STS-117 - . Call Sign: Atlantis. Crew: Anderson, Clayton, Archambault, Forrester, Olivas, Reilly, Sturckow, Swanson. Return Crew: Archambault, Forrester, Olivas, Reilly, Sturckow, Swanson, Williams. Payload: Atlantis F28 / S3, S4. Mass: 122,685 kg (270,474 lb). Nation: USA. Related Persons: Anderson, Clayton, Archambault, Forrester, Olivas, Reilly, Sturckow, Swanson, Williams. Agency: NASA. Manufacturer: Boeing. Program: ISS. Class: Manned. Type: Manned spaceplane. Flight: Soyuz TMA-10, STS-117, STS-117 ISS EO-15, STS-117 ISS EO-15. Spacecraft Bus: Shuttle. Spacecraft: Atlantis. Duration: 13.84 days. Decay Date: 2007-06-22 . USAF Sat Cat: 31600 . COSPAR: 2007-024A. Apogee: 341 km (211 mi). Perigee: 330 km (200 mi). Inclination: 51.60 deg. Period: 91.20 min. The shuttle delivered the S3 and S4 truss segments to the starboard side of the International Space Station. The crew made three spacewalks to install these truss segments, conduct other station reconfiguration and installation work, deploy the solar arrays and prepare them for operation. A fourth spacewalk was added to repair loose re-entry insulation on the shuttle and get-ahead installation work on the outside of the station. The shuttle delivered NASA long-term ISS crew member Clayton Anderson to the station; and returned Suni Williams to earth. At the conclusion of this mission the station finally achieved its full-power, dual-boom configuration first conceived for Space Station Freedom in the 1980's. 2007 June 9 - . 2007 June 10 - . 2007 June 11 - . 2007 June 12 - . 2007 June 13 - . 2007 June 14 - . 2007 June 14 - . 18:28 GMT - . EVA STS-117-2 - . Crew: Forrester, Swanson. EVA Duration: 0.30 days. Nation: USA. Related Persons: Forrester, Swanson. Program: ISS. Flight: Soyuz TMA-10, STS-117, STS-117 ISS EO-15. The crew removed all of the launch locks on the Solar Alpha Rotary Joint in place. The spacewalkers had planned to remove the joint's launch restraints as well, but problems with the wiring of a drive-lock assembly installed on the previous spacewalk led to that task being deferred to the next EVA. 2007 June 15 - . STS-117 MCC Status Report #15 - . Nation: USA. Related Persons: Forrester, Kotov, Olivas, Reilly, Swanson, Yurchikhin. Program: ISS. Flight: Soyuz TMA-10, STS-117, STS-117 ISS EO-15. 2007 June 16 - . 2007 June 17 - . 2007 June 17 - . 16:25 GMT - . EVA STS-117-4 - . Crew: Forrester, Swanson. EVA Duration: 0.26 days. Nation: USA. Related Persons: Forrester, Swanson. Program: ISS. Flight: Soyuz TMA-10, STS-117, STS-117 ISS EO-15. The crew moved a video camera from the Quest module to the S3 truss. They verified the connections on the Solar Alpha Rotary Joint and removed its launch restraints. They then removed hardware along the S3 truss, clearing it for use by the tracked Mobile Base System. They then installed a computer network cable on the Unity node; opened the hydrogen vent valve on the Destiny laboratory installed on the previous EVA; and tethered two orbital debris shield panels on the station's service module. 2007 June 18 - . 2007 June 19 - . 2007 June 22 - . 2007 June 22 - . 19:50 GMT - . Landing of STS-117 - . Return Crew: Archambault, Forrester, Olivas, Reilly, Sturckow, Swanson, Williams. Nation: USA. Related Persons: Archambault, Forrester, Olivas, Reilly, Sturckow, Swanson, Williams. Program: ISS. Flight: STS-117, STS-117 ISS EO-15. 2009 August 29 - . 04:00 GMT - . Launch Site: Cape Canaveral. Launch Complex: Cape Canaveral LC39A. LV Family: Shuttle. Launch Vehicle: Space Shuttle. STS-128 - . Call Sign: Discovery. Crew: Ford, Kevin, Forrester, Fuglesang, Hernandez, Olivas, Stott, Sturckow. Payload: Discovery F36 /. Mass: 121,420 kg (267,680 lb). Nation: USA. Agency: NASA. Program: ISS. Class: Manned. Type: Manned spaceplane. Flight: Soyuz TMA-14, Soyuz TMA-15, STS-128. Spacecraft Bus: Shuttle. Spacecraft: Discovery . Duration: 13.87 days. Decay Date: 2009-09-12 00:53:00 . USAF Sat Cat: 35811 . COSPAR: 2009-045A. Apogee: 352 km (218 mi). Perigee: 310 km (190 mi). Inclination: 51.60 deg. Period: 91.20 min. Crew: Sturckow, Ford, Forrester, Hernandez, Fuglesang, Olivas. Deliver to the ISS and install the Multi-Purpose Logistics Module (MPLM); Lightweight Multi-Purpose Experiment Support Structure Carrier (LMC); Three-crew quarters, galley, and second treadmill (TVIS2); and the Crew Health Care System 2 (CHeCS 2).